Winter is upon us and for many this means bitter cold and snow. And with the snow comes shoveling sidewalks and driveways and keeping these areas safe to walk and drive on. If you are like me, you make multiple trips to the hardware store to stock up on rock salt to prevent freezing temps from turning your cleared pathways to a dangerous sheet of ice. But rock salt is expensive and I found some frugal alternatives to rock salt to melt ice. They all work just as good as rocks salt and save you money! At the top of the list is using water softener salt. But water softener salt isn’t your only option. Below are 6 of the best alternatives to rock salt for melting ice and keeping more money in your pocket. Before we get started with looking at the alternatives to rock salt, we first have to understand why rock salt is used in the first place. Why do most people use rock salt in the first place? The main reason is its abundance in the environment. It is easy to get out of the Earth, break down, package and sell. The other reason is because it works fairly well to melt ice. While water freezes at 32 degrees, salt water freezes at a temperature closer to zero. During winter weather, icy surfaces typically receive a treatment of rock salt to help melt the ice and prevent melted snow and ice from refreezing. First, everyone uses rock salt as the preferred way to melt ice. So, odds are in the winter it is hard to come by, especially before or after a storm. Just think of all the news reports at home centers showing the empty pallets where rock salt used to be. Second, rock salt is expensive! The goal then is to find alternatives to rock salt for melting ice that aren’t as in demand or will at least be available to buy when a storm comes. Another bonus is finding something cheaper than rock salt too. Luckily, with a little creativity, you have options. Let’s dive into them. Don’t get stuck paying high prices for rock salt just because everyone else uses it as one of the preferred ways to melt ice. It turns out there is another item sold at hardware and home improvement stores that will do the same job and is a fraction of the price. One of the best alternatives to rock salt is water softener salt pellets. Water softener salt is typically used to remove minerals in your water supply that cause reduced suds and leaves a white crust on your fixtures. This salt is used to extract these “hard” minerals from your drinking water. Because the salt minerals get replaced with the hard water minerals in the water softener tank, the salts used have to be safe for human and pet consumption. As a result, water softener salt uses sodium chloride or potassium chloride, just like the pet-friendly deicing rock salt. Because of this, you can use water softener salt for ice melt. And despite being the same thing, water softener salt is much cheaper than rock salt. A look at the website of my local hardware store reveals the cheapest price for a 40-pound bag of zero ice melt to be $17. Water softener salt, however, costs as little as $6 for the same size bag. That is a savings 65%! A single 40-pound bag will last me all winter. By going with water softener salt, I save $25 every winter. While this doesn’t sound like much, the savings over the length of my adult life should exceed $1,000. And I only use 1 bag a winter. If you live in a snowier climate, your savings will be more. Your next question might be what is the best water softener salt pellets to buy? I would make when switching from buying expensive rock salt to identical water softener salt pellets as a way to melt ice. Spend the extra money to get the bag that is not marked “extra coarse”. Larger grains of salt may work better for a water softener system. But for de-icing the driveway, it simply means that you are forced to use more to accomplish the same amount of melting power. Instead opt for smaller water softener salt pellets. These smaller pellets will do a better job at melting the ice and it will last you longer, saving you even more money. Finally, you might be wondering if water softener salt pellets are safe for concrete and driveways. The simple answer is yes. You can freely use water softener salt on concrete and driveways. However, over the long term, understand that it can still be corrosive to these surfaces, just like rock salt. With that said, it will take a lot of salt pellets and many years of use to begin to see issues. If you have pets, you may want to consider this alternative for melting ice. While it is a little more expensive than water softener salt, Safe Paw is pet friendly and comes in pellets. This means you can use less than you would of rock salt and get the same effect. It also has a time release aspect to it, so it keeps ice at bay for up to 3 days. Why would you want to spend the extra money if you have pets? If you have dogs, rock salt can be a big issue. The reason is because salt can seep into their paws and the fur. When the temperature rises, the salt can burn the skin surface, causing redness and skin ulcers. This could ultimately lead to bacterial infections. Understand that this is rare, but it is a possibility. Another of the alternatives to rock salt is to combine dish soap, rubbing alcohol and warm water. To make it, mix about a quart or a half-gallon of lukewarm water, a teaspoon or two of dish soap, and a tablespoon of rubbing alcohol. When tested, it melted ice almost immediately. While there is some prep work to do, you can avoid lugging around a heavy bag of salt! Plus, it is probably the cheapest option on the list. The biggest downside though is that you will have to make it every time you want to use it. For this reason, most people will choose to go with one of the other options. While sand won’t melt the ice, it will provide traction on icy surfaces. You can spread it out and not worry about slipping. It is also environmentally friendly so you don’t have to worry about harming the environment, yourself or your pets. And it is cheap too. If you decide to go the sand route, look for brick sand as opposed to play sand. The difference is that brick sand is more granular meaning you can use less of it for greater effect. If you have a fireplace at home, use the ashes on the ice in your driveway as alternatives to rock salt. It sounds crazy but the ashes will melt the ice. They absorb the heat of the sun and warm up quickly which helps to melt the ice. They also work at providing traction on icy surfaces too. I can attest for this one personally. Growing up, we had a coal stove and my Dad would empty the ashes every night and spread them in the driveway. It was amazing how they worked to melt ice. This one is hit or miss. Some people swear by it. Others claim it is worthless. As such, I would suggest you try the options above first and use this as a last resort. To use, you have to still use a small amount of rock salt to really be effective, at least this is what I’ve found. When you mix the two together, the beet juice lowers the melting point of rock salt below 15 degrees. And by adding the sticky beet juice, you stop the salt pellets from bouncing everywhere. In other words, you keep them in a contained area. Many states claim beet juice works so well, they use it for treating roads! The best news though is that one day, you may not have to shovel snow again! How is this possible? Researchers at Drexel University, Purdue University and Oregon State University discovered that adding paraffin oil to concrete enables the snow to be melted on its own! 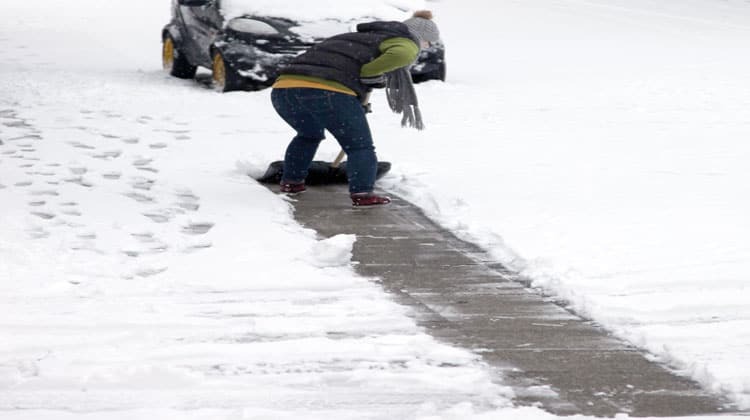 While this doesn’t help you today, you can always fantasize about it when shoveling, knowing that one day you may not have to do this again! You can read more about their discovery here. There are 6 alternatives to rock salt that will melt ice and provide you traction. You can use all of these on concrete and your driveway too. And in most cases, these alternatives are cheaper and safer for the environment too. I would encourage you to try out water softener salt first since you can get that at the home improvement store for a good price. But if you have pets, it would be worth it to try out Safe Paw. Just knowing that there is zero chance of harm to your pet is priceless.